Over the last 15 years, the CTA Blue Line has seen continuous increases in the number of riders and has had little to no updates to accommodate both old and new passengers, an analysis of CTA documents shows. This includes remodeling train cars and stations, security additions, and adding more cars/running more cars during high traffic times. 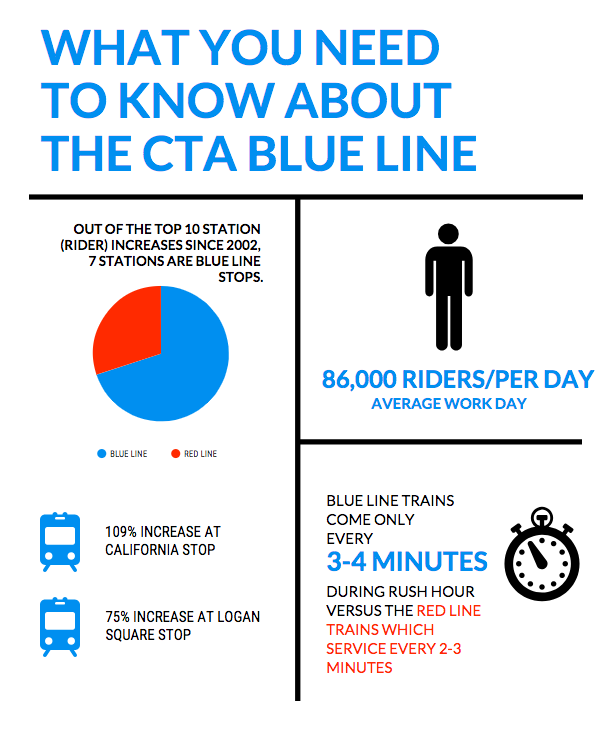 Over 86,000 passengers ride the Blue Line on an average work day, and the line services 33 stops from O'Hare to Forest Park. The increase in ridership at the stations is primarily due to Chicago residents moving northwest of the Loop and into neighborhoods such as West Town, Wicker Park, Bucktown, East Village and Logan Square. Recent high-rise construction on streets such as Milwaukee and Division, have been points of focus for dispute. This dispute includes building zoning laws, the lack of parking for residents in the new buildings and elimination of parking for other residents on the block. This migration to Northwest Side neighborhoods is one of the largest factors that contributes to overcrowding on the Blue Line, experts say. With the increase of people that are utilizing the line as their main form of transportation, there are no efforts from the CTA to accommodate these extra riders. Blue Line riders not only are frustrated with the lack of room on the train, but the lack of cars during rush hour. Emily Koebnick, 32, a member of the Ukrainian Village Neighborhood page and Blue Line rider for over four years, shared her personal experience during high-traffic times. Overcrowding and delays during rush hour are not the only challenges CTA faces today. Competition with Rideshare apps such as Uber and Lyft have been a large factor in the decline in riders over the last few years. Uber and Lyft not only service you from your exact location, but their shared ride function now competes financially with the $2.50 CTA fare. In the last five years, the safety on CTA trains has improved due to a $26 million expansion and installation project for surveillance cameras. While improvements and plans are in the works, they are not keeping up with the growing rate of commuters as well as the constant delays that trains experience on a daily basis. While the addition of more cameras has been helpful, many still feel like the presence of more employees on the platforms would go a long way. In 1958, the Blue Line was created then known as the West-Northwest Route that stretched from Damen to Forest Park and 54th/Cermak. The Forest Park station was known as the Congress Line with elevated tracks that ran parallel to the highway was the first of its kind in the 1950’s, and would pave the way for many cities all over the United States. The north end of the Blue Line then known as the Milwaukee Line followed suit with elevated tracks running first to Jefferson Park in the 1970’s, and then to O’Hare in 1984 with tracks running parallel to the highway. The name change not take place until 1993 when the CTA adopted a new color naming system. There is a distinct difference between the Blue and Red lines in regards to the stations as well as the train cars, and how they're being handled by the CTA, Schwieterman said. 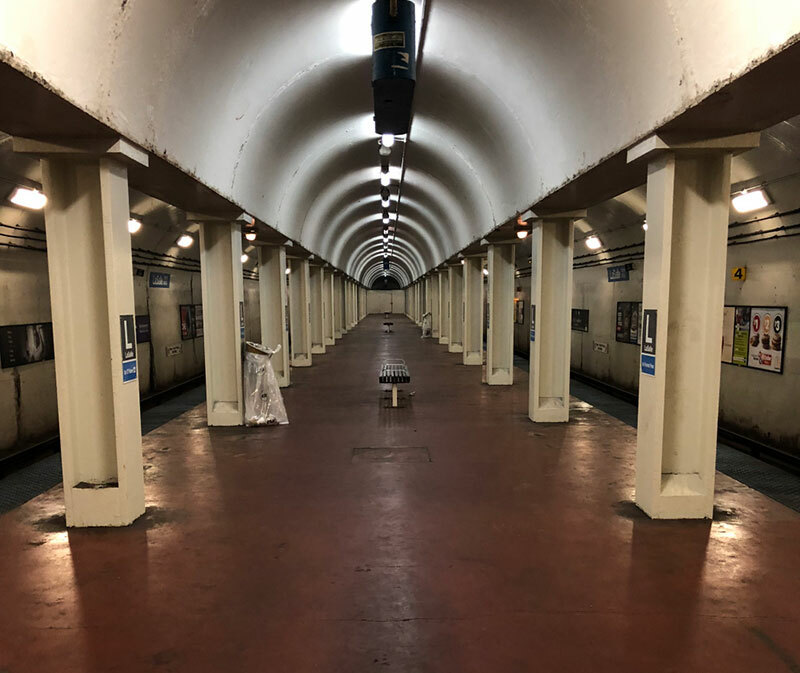 In the recent years, not much has been done with the upkeep of the Blue Line stations while the Red Line has received and continues to receive funds for improvements. As of now, the Blue Line has no set plan(s) to change current operations. This includes running more cars during rush hour, lengthening station platforms in order to add more cars, and adding more security personnel down on the platforms. Schwieterman had some concluding thoughts for the future agenda of the CTA- “I think the stations could use a face lift, especially outside of downtown. Logan Square and others they are pretty weathered. I still think we are lacking digital signage at most stations. I’m skeptical we are really going to get fast trains to O’Hare in the next decade. Editor's note: The CTA did not respond to multiple interview requests for this story.